If you were injured in a pedestrian or bicycle accident in Cincinnati, you may be entitled to financial compensation for your injuries and expenses. Pedestrians and bicyclists have nothing to protect their bodies in the event of a collision, which is why motorists have a duty to watch out for them and respect their rights on the road. When a driver fails in their duty to protect the safety of a pedestrian or bicyclist, they can be held financially responsible for their negligence. If this has happened to you, you need the Cincinnati pedestrian/bicycle accident attorneys of Lawrence & Associates to fight for you. The experienced and award-winning attorneys of Lawrence & Associates have represented numerous victims of pedestrian and bicycle accidents throughout the Cincinnati area. We’ve earned a national reputation for success in personal injury cases. We are a 10.0 Avvo rated law firm noted as a Top Attorney for car accident cases. We are also rated by Super Lawyers and are listed among the Top 100 firms by The National Trial Lawyers organization. We fight to protect the rights of those injured in pedestrian and bicycle accidents. Contact us at (513) 351-5997 to schedule a free consultation and get started on your case – we do not get paid unless you do! Do I Need a Pedestrian/Bicycle Accident Attorney? If you’ve been severely injured in a pedestrian/bicycle accident, all your time and energy is likely focused on recovering as quickly as possible so that you can get back your work, your family, and your life. You may not have the time and energy to also fight against the insurance companies and lawyers to get the compensation you deserve for your injuries. You need a pedestrian/bicycle attorney who will take on the burden of fighting the insurance companies and law firms for the recovery you’re entitled to. Pedestrian/bicycle accident attorneys are well-versed in the types of damages victims of such accidents suffer. An attorney will know how to gather the information required to add up the costs you have already incurred. They will also be able to calculate your future damages by consulting experts to learn what future medical expenses you’re likely to incur and how much future income you stand to lose because of your injuries. An attorney can determine a fair and reasonable compensation figure that you should ask for, and negotiate with insurance to ensure you get it. 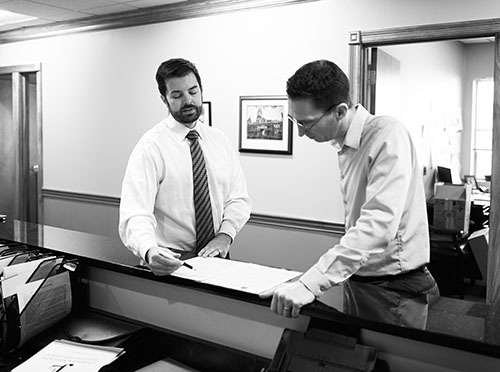 The experienced and award-winning Cincinnati pedestrian/bicycle attorneys of Lawrence & Associates are the personal injury litigators you need on your side. We have the experience and the knowledge to put together a compelling case for compensation. We have won millions of dollars in compensation for past clients. Customer service is one of our primary values here at Lawrence & Associates. We will handle your case in a diligent and efficient manner, always keeping each appointment with you and keeping you notified of every development in your case. We also never want worries about money to prevent someone from seeking the legal representation they need. That’s why you will never pay us a dollar unless we obtain a recovery for you. Bicyclists and pedestrians are liable to suffer extremely severe injuries when they are involved in collisions because they are afforded little-to-no protection, unlike the drivers of cars. For this reason, drivers have a responsibility to respect bicyclists and pedestrians on the road and keep them safe. Unfortunately, even when bicyclists and pedestrians obey every law, they can still sometimes be injured in accidents. If you’ve been injured by a motor vehicle while walking, standing, or riding a bicycle, Lawrence & Associates is ready to pursue your claim and get you the compensation you deserve. If you’ve been injured in a bicycle or pedestrian accident, you are likely feeling overwhelmed and may not know how to get started with your injury claim. To ease some of your stress, we have provided the answers to some frequently asked questions. If you have specific questions about an accident, call us at (513) 351-5997 to schedule a free consultation right away. What should I do if I’m a pedestrian or cyclist involved in an accident? Assuming you don't need immediate emergency medical attention, gather information at the scene of the accident before seeking medical attention. Take pictures of the accident scene, including injuries, vehicle damage, skid marks, road conditions, and weather. If you are unable to do this yourself, as a friend or family member to do so for you. Refrain from speculating about the cause of the accident, making any kind of statement about your injuries, or apologizing when speaking to the other driver, police, or insurance. They may use those later to prove you were partially or completely at fault for your accident. Avoid signing any documentation from the insurance companies, even if they claim it is necessary to “process” your claim. You may end up signing away critical rights and losing the ability to seek compensation for all your damages. You should contact a pedestrian/bicycle attorney as soon as practical. Pedestrian/bicycle attorneys are experienced in investigating and handling claims such as yours and will ensure critical evidence is found and retained before it is lost. Hiring an attorney as soon as possible will also start the process of resolving your claim so that you receive fair and reasonable compensation. Even if you don’t feel like you were injured in your accident, you should see your primary care provider immediately after the accident. They may discover injuries you were unaware of. Getting treatment soon after your accident may also help you prove that your injuries were the result of the accident and not some other cause. Never accept a settlement offer until you first review it with an experienced pedestrian/bicycle attorney. The insurance companies know you are likely suffering from serious injuries, are facing expensive medical bills, and may be out of work. They are probably looking to take advantage of your desperation with a low-ball settlement offer. Don’t accept any settlement or sign any documents from the insurance company until you’ve spoken with an attorney who can advise you about your rights and what kind of compensation you may be entitled to. How much does a lawyer cost to handle my pedestrian/bicycle accident? When you hire Lawrence & Associates to handle your pedestrian/bicycle accident case, you do not have to pay us anything unless we obtain compensation for you. We offer free consultations and will accept your case on a contingency agreement. If we obtain a settlement or a favorable judgment for you, our fees, case expenses, and court costs will be paid from the compensation you receive. Past and future medical expenses: Includes not only doctor visits and medication but also durable medical equipment and other equipment you may need to accommodate any disabilities you’ve suffered. Past and future lost wages: You should be compensated not only for the work you’ve missed but the income you may miss out on if you must return to work with fewer hours or in a role with lower pay. Past and future pain and suffering: You deserve compensation for the pain you’ve suffered and for the loss of enjoyment of life activities you’ve missed out on because of your injuries. Loss of consortium: Depending on your marital and family status, your loved ones may also be entitled to compensation for the loss of your companionship as a result of your injuries. If your loved one was killed in a pedestrian or bicycle accident, certain family members may also be eligible for compensation for medical expenses, funeral expenses, loss of support, and more. The pedestrian/bicycle accident attorneys of Lawrence & Associates will work diligently and efficiently to resolve your claim. If the other party accepts responsibility for the accident, it may be possible to quickly resolve your claim if your damages are easily calculable. However, if the parties contest liability or the extent of your damages, it may be necessary to take your claim to court, which will take much longer. The Ohio Department of Transportation reports that, in 2017, there were 144 pedestrian fatalities on Ohio roads. In only 30 accidents was pedestrian use of alcohol and/or drugs suspected. Twenty-six percent of fatal pedestrian accidents involved a hit-and-run. The majority of fatal pedestrian accidents, 53 percent, involved a pedestrian crossing, walking along, or standing in a roadway. In 2017, AAA reported that approximately 1500 bicycle traffic accidents occurred in Ohio, resulting in 169 incapacitating injuries and 19 deaths. When you’ve been seriously injured as a pedestrian or bicycle rider in a traffic accident caused by someone else, you deserve compensation for your injuries and expenses. The Cincinnati personal injury attorneys of Lawrence & Associates will work non-stop for you to make sure you get the compensation you deserve and need to get your life back. Don’t wait another minute; contact us at (513) 351-5997 for a free consultation to learn what next steps you can take.